As you probably know, I'm working as an editor at SWYF. We got a special blogitem called 'What to wear'. Every day someone else is showing an outfit. I wanted to share my look of today with you guys. What a lovely weather we had this weekend! It was perfect for a barbecue. So I went crazy I hosted not one, but two barbecues. Yes, very enthusiastic. Eating outside, sitting on the grass and zipping wine out of plastic cups gives me this hippie feeling, which is main inspiration of this look. 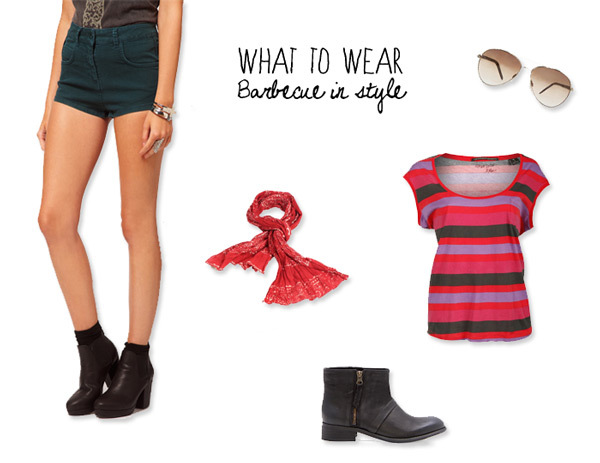 This week's What to wear: barbecue in style (because everything we do, we do in style). This summer I've seen many bandanas. I never thought I could pull it off, but in fact I think everyone can pull of a bandana. You don't have to worry about your hair, just put a bandana around your head and it really looks like you did effort. To give the outfit a bit more edge, I put on a black high waisted shorts and biker boots. It's still a summer's look, that's why I chose this colorful top of Maison Scotch. Tuck the top a bit in your shorts for a more sixties/rock look. You're ready to grill in style!